​Les Couventins de Saint-Montségur (Conventuals of Holy Montségur) (CSM) is an Order of the Gnostic Ecclesia erected in defense of the Throne of Montségur. + This is an Order of Men, free and of good repute, not perfect, but desirous of that estate; not pure, yet seeking inner cleanliness; who have circumspectly pondered the Eight Lights of Gnosis and agree to compliance with them all, sacrificing all for the Seventh. + These Men may walk in solitude, but any of these Men may abide by and couple with a companion of his choice. 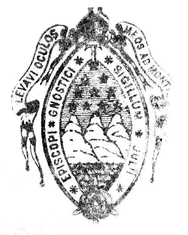 + There are Five Ceremonies of Ordination kept in faithful observance to the Code of Montségur and the sacred memory of those whose bodies perished before the Castle, yet preserved the Charity and Luminosity of the Holy Gnosis for all eternity unto the Aeons of Aeons. + In their words and deeds, these Men shall demonstrate the fire of everlasting love, divine love and infinite compassion to all beings and unceasing assistance in all their evolutionary tasks. For these Men are the keepers of the treasure. + These Men shall come to know the true meaning of Holy Orders. They shall become the Sons of God and know their cousins the Nephilim, or Watchers; they shall understand the Great Pentalpha of Pan, the Holy Ineffable Pentagrammic Name of the Lord, having the Blazing Star of the Magi of all Aeons hovering over their heads.